Who will get a Fantasy scoring boost thanks to new rules? LUKE Ryan and Jake Lloyd are set to gain the biggest boost in their AFL Fantasy output with the new kick-in rule. Players bringing the ball back into play following a behind no longer have to kick to themselves if they wish to kick the ball from outside of the goalsquare. They also have extra space to ply their trade with the opponent standing the mark now a further five metres back. It was an entertaining part of the game for Fantasy coaches hoping for their player to kick to himself and gain the bonus stat as Heath Shaw has done so many times in his career. It is now a lot easier for them to be awarded the +3; they now just step outside of the square. Champion Data recently announced that a disposal will continue to be counted for any kick taken outside of the square, however, a handball will count regardless of whether it is disposed in or out of the square once the umpire has called play on. Currently it is a bit of an unknown what types of players clubs will use to take the kick-in and what strategy they will employ; whether they look to go longer more often or opt for different teammates. What is safely assumed is that there will be more kicks recorded for the designated kicker and in turn, a bump in Fantasy numbers. Individuals who had high kick-in numbers but rarely kicked to self will be worth monitoring as having the biggest upside if they take advantage of the extra space allowed. Watching the JLT Community Series and early games will be important in order to understand how the new rule will evolve. Luke Brown rarely gets a mention from Fantasy coaches but he may gain some relevance as a late selection in Draft leagues. Although he had the sixth most kick-ins in the competition last year, he may have some competition for the role from Brodie Smith based on his kick-in numbers from previous years. Smith is already seen as a value pick for 2019 due to his price discount after managing just two games last season. If he adds some bonus kick-in stats, he may produce career-best Fantasy numbers. Bringing the ball back into play more than half of the time for the Lions, Alex Witherden will be hot property when it comes to finding an under-priced premium defender. Already averaging 88 in his first two seasons, natural improvement and a projected bump of five to eight points could see the 20-year-old knock on the door of a 100-point average. Veteran defender Kade Simpson is likely to be the go-to man once again for the Blues in the absence of Sam Docherty. While all players taking kick-ins are likely to receive a scoring boost, Simpson’s will be at the lower end as he would kicked to himself 50 per cent of the time last season. With Lynden Dunn likely to miss the first few weeks of the season, Jeremy Howe and Brayden Maynard will most likely share the duties. Howe’s average dropped by eight points last season on his career-high 2017 and could see a return to this off the back of the responsibility of taking the kick-ins. The retirement of Brendon Goddard may see Conor McKenna take the majority of Essendon’s kick-ins. If the Dons are keen to use his pace, he may put himself into calculations as a late Draft selection or free agent pick-up. Adam Saad could be used similarly. Michael Hurley will be one to watch as if he gains some bonus points when he takes the kick-in, he could be back in the conversation as a premium defender. It’s a two-man show at the Dockers with Luke Ryan and Nathan Wilson sharing the job last season. 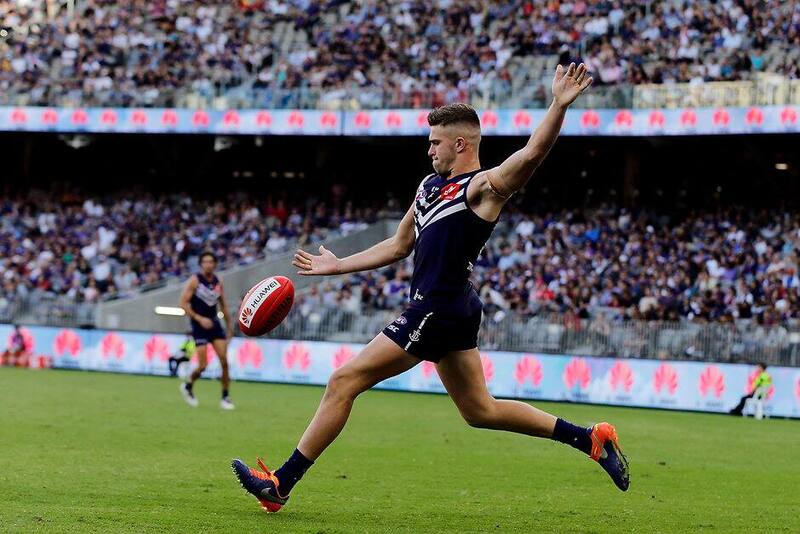 The upside could be huge as Fremantle’s kick-to-self percentage was the lowest in the League. Ryan could see the biggest scoring bump of all defenders if he elects to leave the square as only one of his 107 kick-ins last year was taken from outside of the square. As a team, the Cats played on one third of the time last season. Zach Tuohy and Tom Stewart were the main options from the goalsquare. Stewart opted to play on more than half of the time and is regarded as the safest option with the fewest opposition scoring shots resulting from his kick-ins. Due to his high kick-to-self percentage, Stewart has minimal upside unless he is the preferred option moving forward. The departure of Steven May could open the door for Jarrod Harbrow to increase his responsibility following a behind. It’s a safe assumption that the Suns will be one of the most scored on teams this year and depending on the strategy employed by the new-look Gold Coast outfit, Harbrow will have some Draft relevance as he could potentially average in the mid-80s. Pearce Hanley will also find the ball in his hands at times following a behind. Heath Shaw has been a favourite of his Fantasy owners as you always had the feeling he knew he’d be getting a bonus stat when he kicked to himself. Shaw had the highest kick-to-self percentage of all defenders taking kick-ins, meaning he was already getting those extra stats more than half of the time anyway. There could be some competition for Shaw if the Giants opt to use Zac Williams’ pace or Lachie Whitfield’s precision more frequently this year. Before his late-season injury, James Sicily took the most kick-ins for the Hawks. Although his kick-in buddy Ryan Burton is now at the Power, the return of Grant Birchall may nullify some of the potential increases as the veteran was clearly Hawthorn’s most used option when in the team. Still, Sicily doesn’t need to take too many kick-ins to take his average over 100 points to be in the mix as a top-six defender. The arrival of Steven May is likely to see some changes for Melbourne in 2019. The former Sun took the most for his previous club last year and may have the duties at the Demons. Jordan Lewis, Christian Salem and Michael Hibberd are others who frequently take kick-ins. The Roos looked to go long with their kick-ins more than any other team last year. To gain that extra distance, we may see Jamie Macmillan pushing an average of 80 and becoming Draft relevant despite generally not being drafted in previous seasons. The addition of Ryan Burton will mix things up for Port Adelaide after Dan Houston and Riley Bonner were the main men in 2018. Burton has been earmarked for a half-back role and if he is likely to take on the kick-in role, there is plenty of upside for the former Hawk. His second-year average of 84.4 was followed by 62, pricing him at $450,000 and a potential value pick. Jayden Short was entrusted with the duties for last year’s minor premiers for more than half of the Tigers’ kick-ins. As he only played on 16 per cent of the time, he may choose to run out of the square more often in 2019 to gain that extra distance on his already booming boot. It is expected that Shane Savage will take the majority of kick-ins as he looks most suited to take advantage of the new rules. Savage has averaged 81.5 in the last two seasons and should produce career-best numbers considering his low kick-to-self percentage. Also in the mix for the job is Dylan Roberton, who only played four games last season and will take on the role when required. Jake Lloyd could take the mantle as Fantasy’s No.1 defender with the new rule. He took the most kick-ins last season, 22 clear of Shannon Hurn, playing on 29 per cent of the time. Even if he took 50 per cent of his kick-ins from outside of the square, Lloyd’s average would overtake Rory Laird’s 2018 figure. Jarrad McVeigh will continue to bring the ball back in after a behind and new recruit Jackson Thurlow may be used if selected. As Shannon Hurn regularly kicked to himself and kicked long when playing on, things are likely to stay the same for the Eagles. Despite the relatively high kick-to-self percentage, Hurn will most likely see a decent bump in his average to the mid-90s due to the number of kick-ins he takes. The Bulldogs are likely to share the kick-in duties once again this year. You could throw a blanket over the kick-in specialists with Jason Johannisen, Bailey Williams, Matt Suckling and Brad Lynch all taking plenty between them. Expect Suckling to be the preferred option and take advantage of the new rule, playing on from the square and using his super left boot to gain extra metres.